Dive Resort Ocean Dreams Tenerife i Tenerife, Spanien: Reservér nu! Located at 50 meters from the beach Los Cristianos, Dive Resort Ocean Dreams Tenerife has a wonderful views. This Cultural Sporting Association for water sports and defense and knowledge of the sea has a rooftop terrace with chill out and the best views of the beach where you can enjoy a good barbecue with your new friends, or get exclusive promotions for watersports, courses and a lot of activities in a natural way. Dive Alive Club offers an extensive facilities in an exclusive location. It also offers free Wi-Fi throughout all the facilities and its staff will help you in everything you need. 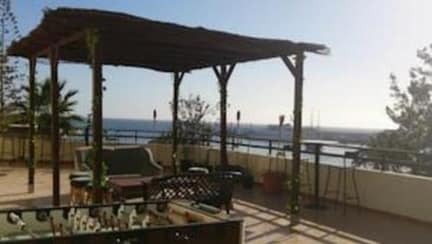 500 m2 in front of the sea that give hospitality to 36 people , so your stay will be very familiar and friendly with the other guests and residents. And now is the better time to try dive, snorkeling, surfing, sailing or just nice boating!! The bedrooms has a original and very nice decoration with bunk beds and a balcony overlooking the sea. You can choose 4,6 or 8 beds-room: Bali, New York, Canarias, Kenya, Hawaii or Filipinas all of them with very nice and original decor. There is a shared bathroom. 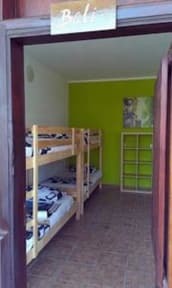 The hostel offers a common living space outdoors with great views for guests. havde et ophold på dette Hostel, er godt tilfreds.